Unless you live in a perfect climate, you’re going to be running your air conditioning and/or your furnace during some portion of the year. Here in the Midwest, both appliances see use as you’ll see a 120 F temperature swing over the course of a typical year (-15 F in the winter to 105 F in the summer is completely normal). When the inside of your house is at a different temperature than the outside of your house, there’s going to be some heat transfer. During the cold months, the heat in your home is going to leak out. In the warm months, the heat is going to leak in. The more leakage you have, the more your appliances have to run. The more your appliances run, the higher your energy bill is going to be. As any homeowner will tell you, few things alter your energy bill like an air conditioner or a furnace running all the time. What can a homeowner do? A homeowner (or even a renter) with an eye toward saving money on their energy bill will take steps to reduce that flow of heat into and out of their home. One key element in this fight is insulation. It does a pretty good job of keeping the heat where it should be, particularly if your home is well-insulated. That’s just part of the story, though. Your windows and door frames aren’t nearly as insulated as the walls in your home. This is particularly true around the edges of your windows and doors, where there can be a gap or at least some looseness. Air can flow through those gaps, and when there’s a big difference between the temperature outside and the temperature inside, the heat will flow right along with it. The best solution to this battle – and one that can potentially save you hundreds of dollars a year – is air sealing your home. It’s a weekend project, but it’s something that you can do once and leave it alone while it trims your energy bill significantly in the winter and summer months. Most of the basic steps of air sealing your home are easy. Put an air-blocking strip on the bottom of any doors that may have a draft. 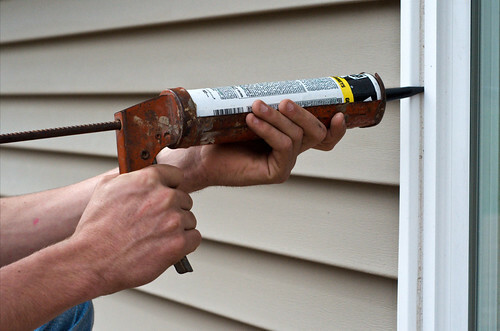 Caulk your windows so that air doesn’t flow through the cracks. Add some insulation where you can. Seal up any exposed ducts. These are all straightforward tasks. If you want a thorough guide to walk you through all of the steps, start with this guide from the Department of Energy. Once you do this, you’ll find your energy bill to be lower than last year during your next air conditioning or furnace season. That’s saved money that goes straight into your pocket.